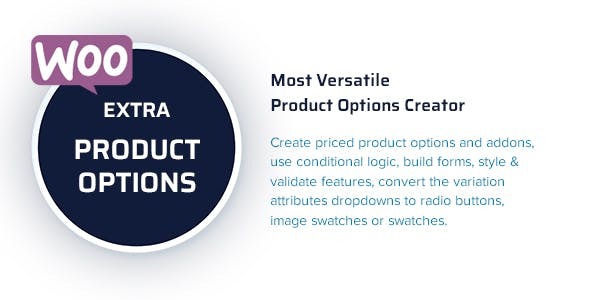 You can create priced product options and addons, conditional logic (within the form builder), build forms, style & validate features, convert the variation attributes dropdowns to radio buttons, image swatches or swatches and much more. You can even control the placement of your new fields with the Form Builder. Full support for checkboxes, radio buttons, select boxes, text-areas, input boxes, upload, date, range picker and color picker. Check out some of our 5 Star Reviews from actual customers below! Please ask any question before buying to make sure the plugin works the way you want to! More field types will be available soon! Conditional logic for fields and sections within the form builder. Partial Compatible with WooCommerce Dynamic Pricing & Discounts. Compatible with WooCommerce Currency Switcher. Fixed prices per currency are not supported. Fixed an issue with the today button in the date-picker. Fixed an issue with the date-picker not populating default year on field mode. Fixed an issue with the date-picker not using the correct date format. Fixed an issue with the range picker showing incorrect decimal values. Fixed an issue withe variable product where showing incorrect price. Fixed an issue with the tool-tips on styled variations. Added two new string replacements. Fixed an issue with the border on the variation swatches. Fixed an issue where elements couldn’t be validated when using Subscriptions. Fixed an issue with subtitle tooltips. Fixed an issue with html escaping on descriptions. Added setting to hide choice label when using the swatch mode for radio buttons and checkboxes. Added setting to alter generated product structured data. Fixed not showing the style variations for new products. Fixed an issue with product image replacement when multiple elements had it active. Fixed an issue with conditional logic and required fields. Fixed several JS and CSS issues when using composite products. Fixed several display issues from addon plugins. Importing a CSV file now properly imports default values in check-boxes. The builder now works on Gutenberg enabled product post. Refactored many functions, classes, templates and prefixes. Added setting to split items with multiple values to unique lines for the Order and emails. Fixed an issue where the heading element wasn’t visible. Fixed an issue with price rounding. Fixed an issue where a product couldn’t be loaded when using the variation in global forms. Changed the registration process to use the Envato API Personal Token instead of the API key that has been deprecated. Users will have to update the plugin license settings in order to receive updates. Added price per word price type. Added remove image button for the swatches. Added exclude products functionality for global forms. Fixed several price display issues. Fixed the hide value and label functionality for fees. Fixed the disables roles to work correctly on global forms. Fixed several error warnings for old WooCommerce versions. You can now attach variations at the global form. Fixed an issue where prices were set as zero when using conditional logic. Fixed an issue with conditional logic when displaying options on custom pages. Fixed an issue where quantity fee wasn’t working correct. Added shortcode to show the options from the current product id. Fixed compatibility with Woothemes Bookings. Fixed compatibility with Woothemes Subscriptions on the backend Order when using subscription fees. Fixed an issue with styled variations. Fixed a price display issue when using negative prices. Fixed a display issue with Dynamic Pricing and Discounts. Fixed an issue with conditional logic when using multiple rules. Fixed an issue were decimals were omitted from prices. Fixed a bug is Webkit browsers where the upload element was always selected. Fixed an issue with WPML multi currency. Added a setting to disable options cache for older configurations. Added optional setting to display plus/minus signs on the options. Fixed an JS bug in the admin builder interface. Fixed an issue where hidden elements prices were not being calculated until the element was selected. Fixed an error when using conditional logic and the slider wizard for sections. Fixed an issue with the prices not being calculated at the page load. Fixed a currency displayed issue. Fixed an issue where the options container was hidden for various themes. Added a setting for Woothemes Measurement Calculator to set if you want to multiply the option prices by the calculated area. Fixed several issues when using disabled elements for the logic and slider. Fixed a price display issue for select boxes. Fixed several price display issues on the back-end. Fixed an issue where coupons could not be removed from the back-end order. Fixed compatibility with the Measurement Price Calculator plugin. Fixed compatibility with WooCommerce Currency Switcher. Fixed compatibility with WooCommerce Subscriptions. Fixed compatibility with Aelia Currency Switcher. Fixed compatibility with Bookings and Appointments for WooCommerce. Fixed several calculation issues with Dynamic Pricing and Discounts. Fixed an issue when deleting options from the Order. Fixed minimum price display when using the override price feature. Performance increase for shop/archive pages. Importing a CSV file now properly imports default values in radio buttons, check-boxes and select boxes. Fixed an error when using the edit product function in the cart. Fixed an issue where the product weren’t updating correctly in the cart. Fixed validation in Composite Products. Fixed an issue with the Measurement Price Calculator not updating the price correctly. Fixed a calculation issue with Dynamic Pricing and Discounts. Fixed a calculation issue when using normal options. Fixed an issue on Order currency when using WPML. Fixed an issue where the prices in the backend Order weren’t updating correctly. Fixed compatibility with Dynamic Pricing and Discounts. Fixed several issues with altering fees tax class. Fixed an issue where adding fees with same name was not adding the prices. Fixed a template issue with the text-area field. Fixed several fatal errors after WooCommerce 3.2x update. Added setting to show tool-tips for radio button and check-boxes inline. Fixed an issue where a parse error was being thrown for older PHP versions in the select field template. Fixed an issue with the variation swatches not being clickable. Fixed an issue with default option values when editing the product. Fixed an issue with tax calculation. Fixed an error display on the thank you page for variable products. Fixed the from price display when using override price. Fixed an issue where it wasn’t possible to edit prices in the Order. Fixed an issue with ajax add to cart solutions. Fixed an issue with the radio button quantity selector where always the last one was being posted. Fixed an issue with the radio button and checkboxes templates. Fixed an issue when creating renewals on woothemes Subscriptions. Fixed an issue where on some situation an error was happening at checkout. Fixed an issue with template override inclusion. Fixed various css and js incompatibilities and issues. Fixed compatibility with q-translate-X plugin. Fixed compatibility with Currency Switcher. Fixed compatibility with woothemes Measurement Calculator. Fixed compatibility with woothemes subscriptions. Fixed an issue with woothemes bookings when using percentage price types. Fixed an issue with the meta data display on some configurations. Fixed an issue where translated WooCommerce strings didn’t use the current translation. Fixed an issue where the custom code didn’t save special characters. Fixed validation for text-fields and text-areas. Added setting to enable or disable options in the builder. Added support for fee price type to the upload element. Added unit price and fee to the final total display. Added settings to control the initial fading animation on he options. Added extra security check for settings Ajax calls to enhance security. Fixed a display price issue when price include tax. Fixed an issue with swatches not being clickable in IE. Fixed various issues having to do with the color swatch. Fixed compatibility with woothemes Measurement Price Calculator. Fixed a price display issue with WPML. Fixed a date issue when rtl is used. Fixed an issue with text-area price type. Fixed swatch mode tooltips not showing. Fixed the global setting Override price to work properly. Fixed an issue where variable products didn’t get the correct pricing. Fixed an issue with Bookings and WooCommerce Multilingual currency. Fixed an issue with the select box when replacing the product image. Fixed an issue with Avada custom product image gallery. Fixed an issue where saved options weren’t being displayed in Orders. Fixed an issue where Fees that were assigned without taxes were being displayed with taxes on some elements. Fixed an issue where it wasn’t possible to assign multiple products to a global form. Fixed wrong prices displayed on Order for WPML currency. Renamed local mode to normal mode. Added setting to datepicker to control default value. Added setting for adding custom CSS and JS. Added partial compatibility with Booking & Appointment Plugin for WooCommerce. Uploaded files are now being sent as attachment to the order emails. Fixed an issue with styled variation color and image swatches. Fixed an issue with the selected borders for radio buttons and checkboxes. Fixed an issue were selecting radio buttons and checkboxes was not possible. Fixed an issue where adding a large amount of options to the cart was causing problems. Fixed double option display for Woothemes Subscriptions on renewals. Fixed a display issue with WooCommerce Measurement Price Calculator plugin. Fixed compatibility with Aelia Currency Switcher and WooCommerce Currency Switcher. Fixed an issue with the form validation on certain themes. Fixed an issue with styled variations in translated WPML products. Fixed an issue with pricing on WPML translated products. Fixed an incompatibility with WooCommerce Bookings when using the WPML currency. Fixed an issue with the validation for certain field values. Fixed an incompatibility with WPML. Fixed an issue with Order prices. Option quantity selector now needs to be greater than zero to add the option to the cart. Added setting to globally set min/max chars for text-fields and text-areas. Fixed an issue with WooCommerce backwards compatibility. Fixed an issue were certain characters on translations were preventing json encoded data from functioning with the options. Fixed an issue with Yith Quick View plugin. Fixed an issue with Fancy Product Designer. Fixed an issue with some language locales. Options with price type Fee now correctly add their prices if they are added by a different cart line product. Options with price type Fee do not take discounts any more as intended. Added setting to prevent zero priced products from being added to the cart. Added a message when uploads are made. Added setting to control the price change on original product price. Added button to the color-picker to prevent situations where the selected color wasn’t being submitted correctly. Added supported for Porto theme gallery. Added ability to replace the Select file text used in the styled upload button. Added ability to enabled or disable a global form by a user role. Added ability to control globally the file types that can be uploaded by the upload element. CSV import/export now supports styled variations. Fixed an issue with the min and max dates on the date-picker. Fixed an issue with WPML and local options. Fixed some issues with the WooCommerce Currency Switcher. Fixed an issue with Fee taxes. Added option to Include option pricing in product price. Added selection when import a CSV file to overwrite existing elements or append new elements. Translated products with WPML that use local options must also translate the attributes being used. Fixed an issue with the Date-picker min and max Dates. Fixed an issue with the stock not changing. Fixed an issue with sales prices and currency converters. Fixed an issue when duplicating or exporting forms that could result in logic not working. Fixed a WPML issue where translating plugin strings wasn’t possible. Fixed an issue with the max characters display for text-areas. Fixed an issue with the Override enabled and disabled roles. Fixed an issue with the quantity selector on radio buttons. Fixed an issue with the date picker for RTL languages. Upload image now have a screenshot on the cart and in the back-end Order. Added ability to control Global forms depending on user role. Added compatibility with Easy Bookings. Fixed an issue where trailing commas in some settings of the date element produced php warnings. Fixed an issue where the check-boxes with images couldn’t be selected. Fixed an issue where variable with default a variation set weren’t displaying the correct price. Fixed an issue with conditional logic interfering with the changes product image feature. Fixed an issue when using enabled and disabled dates in date-picker. Fixed an issue with the out of stock message. Fixed an issue with the color picker that was disabled if it was hidden by conditional logic on page load. Fixed an issue with the conditional logic for certain rules. Fixed an issue with the floating totals when using alternative position. Fixed floating totals options order. Fixed an issue with the lazy load images. Fixed an issue where upon entering values in text fields the price was returned as zero. Fixed min/max value validation when entering zero. Added support for WooCommerce Products Layouts quick-view. Added option to override product price. Fees added with the plugin now show the quantity selector value as well. Added sortable ability to the tabs on the wizard slider on the back-end. Added the range picker to the conditional logic. Added quickview support for Porto and Minishop themes. Added option to prevent options from being sent to customers. Added price per row for text-areas. Added responsive widths for the Items per row setting. Added settings to allow the visibility of the options on the cart and the order. Added short-codes to echo the options and totals box. Added additional price types to exclude n-th chars for the per-char types. Added setting to choose a different image for the lightbox. Added setting to have the image replacement inside the label. Added support for the easyzoom plugin on various themes. Added two new fee types. Added setting to allow the plugin to be disabled for specific user roles. Added setting to allow the enable and disable for rules to be overridden on product level. Fixed an issue with the currency plugins when base product price is zero. Fixed an issue with the currency plugins when using the price type Percent of the original price. Fixed an issue with the currency plugins when using the price type Percent of the original price + options. Fixed an issue with fees and currency plugins. Fixed an issue with the Name your price plugin. Fixed an issue with the validation. Fixed image URL when using SSL. Fees added with the plugin now show the option value as well. Fixed an issue with WooCommerce Currency Converter. Fixed an issue that prevented options to appear when select boxes had no tooltip. Fixed an issue where the totals were displaying the wrong price when using styled variations combined with conditional logic. Fixed an issue with the out of stock message being always active. Fixed an issue where elements could be added to the cart when their quantity selector was zero. Fixed an issue where conditional logic for section was being reseted when moving elements. Fixed an issue with the Measurement Price Calculator on variable products. Fixed an issue with the Percent of the original price + options price type when used in conjuction with a quantity selector. Fixed an issue with the Flatsome quickview. Fixed an issue with WooCommerce Quickview. Fixed a display issue on the backend admin Order interface. Fixed an issue where the global forms weren’t editable after updating to WordPress 4.4. Fixed an issue with WPML 3.3.3. Added setting to choose the number of points in the range picker. Added filters to control the before and after HTML of the floating totals box. Added setting to control the display of the From string on product price display. Added option to disable the totals box. Changed the light-box feature to use the “changes product image” as a priority. Fixed the light-box for check-boxes. Fixed a css bug on hidden prices. Fixed an issue with the slider wizard when it has check-boxes. Fixed an issue with where the options on archive and shop pages weren’t being displayed. Fixed an issue the the styled variations when the variation threshold was being reached. Fixed an issue with the cart edit link not working. Fixed a bug in text-area with the minimum length and updated its validation. Added Price per char (no spaces) to text-fields. Fixed an issue with the wizard and conditional logic inside the wizard tabs. Fixed the light-box feature to work with lazy-load images. Fixed an issue with the date where it was always required. Fixed some validation messages for the elements. Fixed an issue with WooCommerce Currency Switcher. Made the light off by default and added a setting to enabled it. Added partial support for themes that use Ajax on add to cart button. When hiding the totals box options the displayed price on the product changes if the theme supports it. Made the plug-in extend-able. You can now create plug-in extensions to add new elements to the builder. Fixed several advanced cart display issues. Fixed quantity selectors and removed the extra buttons. Fixed the rich text editor in element settings. Fixed compatibility with Currency Switcher (realmag777). Added extra settings for quantity selectors (min,max,step). Added setting to customize the select options string. Added support for Ninja Kick: Sliding Panel for WordPress. Added Price per interval price type to range pickers. Added light-box for image replacements. Added icon tool-tips for labels. Added setting to enable the option on shop and category view. This is a theme dependent setting. Fixed a display issue on global forms list when using WPML. Fixed a js error when options are outside the cart form. Added compatibility with Fancy product designer pricing. Altered the default value setting for the text-area element to accept line breaks. Fixed the styled upload button to show the name of the file that will be uploaded. Added default values for text fields and text areas. Added filters (wc_tm_epo_ac_product_price, wc_tm_epo_ac_product_qty, wc_tm_epo_ac_qty) to control the display of quantities on advanced cart display. Fixed an issue with the floating totals when the extra options are displayed outside the form. Fixed an issue with the floating totals where the value of the check-boxes weren’t added. Fixed an issue where on variable products the Remove Free label wasn’t working. Fixed an issue with the “Hide add-to-cart button until an option is chosen” setting. Fixed an issue with the product_page short-code. Changed color picker to show only hex values. Fixed an issue with WPML translation. Fixed selects on Bazar theme. Fixed the advanced cart for Flatsome theme. Fixed select boxes for Bazar theme. Fixed an issue with the step x price price type on range picker. Fixed an issue on certain themes that the same image was shown on shop page. Fixed an issue with the creation of slider wizards on the back-end. Fixed an issue when editing prices and quantities on the back-end order. Fixed an issue with the tax fee calculations. Fixed an issue where the conditional logic was being reset upon cloning an element. Fixed an issue with Dynamic Pricing & Discounts plug-in when using variations. Fixed a display error when using WPML on non product pages. Fixed an issue with the subscriptions fee. Fixed fontawesome conflicts with themes using older versions. Fixed an issue with short-codes not loading options on some configurations. Fixed an issue on Composite products when using the stepped method. Fixed a conflict with themes already utilizing owlCarousel. Added a setting to enable the display of image replacement in cart and checkout. Fixed an issue on negative prices with Pricing discounts enabled. Fixed an issue with WooCommerce Multilingual where same products with different options where combined to one product. Fixed an issue where the cart item price with woothemes Measurement Price Calculator wasn’t taking into account option prices. Fixed an issue where the wrong link was displayed on translated WPML global forms list. Fixed a display issue with the date picker. Fixed an issue on Composites products when using products that are sold individually. Fixed an issue on Composites products where the review/summary was displaying wrong prices. Options with price type Fee now inherit the tax status and tax class of the product. Added text before price setting. Added support for WooCommerce Quickview. Added slider style for sections. Made validations errors more noticeable to the user. Fixed a display issue with WPML. Fixed an issue where the totals box was being displayed when it shouldn’t. Fixed an issue with styled variations in composite products. Fixed an issue on updating items saved option values on the admin Order. Fixed a conflict between Composite products and discounts when not using per product pricing. Fixed an issue with Composite products and validation. Fixed an issue with Woo Deposits that was showing wrong number on order page. Fixed a display issue on styled variations when using UTF-8 attribute names. Fixed an issue with translation of option on the admin Order. Added setting to control the translation of option on the admin Order for WPML. Added class name “tm-attribute-disabled” for disabled styled variation attributes. Added Minimum number of selected choices for checkboxes. Added setting to choose the decimal separator for user inputs. Fixed an issue with the variation styling when using special characters on attributes. Fixed an issue with Pricing Discounts and Composite Products. Fixed a quickview bug on certain themes. Fixed an issue when the options are outside the form. Fixed an issue with the positioning of the required indicator. Added skins for the datepicker. Added global setting to include the tax string suffix on totals box. Fixed a conflict between the quickview and the floating totals. Fixed a conflict between the quickview and the change product image feature. Fixed a layout issue when creating options on radios,checkboxes and selectboxes. Fixed an issue with the hex color replacement feature. Fixed an issue on the saved Order fields. Fixed an issue where validation negative number were being converted to positives. Fixed the Limit and Exact selection settings to include the optional quantity selectors. Added compatibility with Aelia Currency Switcher with multi-currency support. Added support multi-currency support for WooCommerce Currency Switcher. Fixed conditional logic when using q-translate-x formatted text. Fixed an issue on stock visibility. Fixed an issue with the date picker that prevent it from working. Fixed edit Order to include the item value and added delete ability. Fixed an issue with the styled variations. Added strings for calendar “Today” and “Done” buttons. Added internal naming system for builder elements. Added ability to edit the options on the order page. Added support for Yith Quick view plugin. Added support for Yith Zoom Magnifier plugin. Added support for venedor quick view. Added setting to globally auto hide zero prices. Added setting to allow only specific dates on datepicker. Added tooltip setting for styled variations. Added ability to select related image sizes for image replacements. Added support for themes using the selectric plugin. Added position setting for showing the value of the range picker. Added global settings override for builder elements. Added minimum and maximum values for text fields. Added minimum characters for text fields. 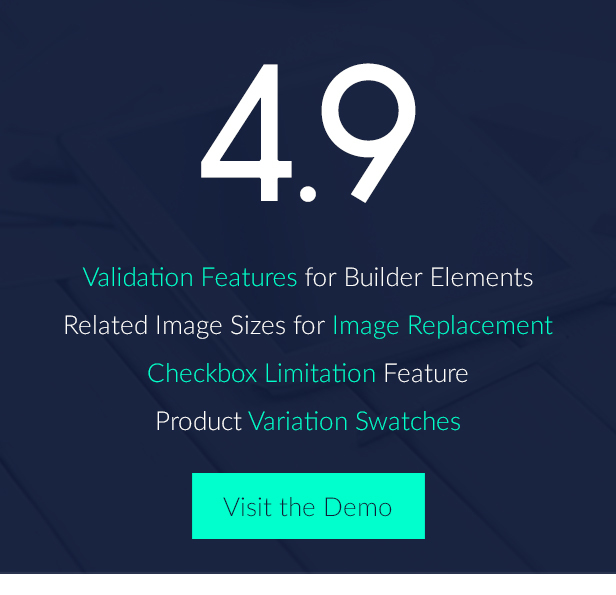 Added validation features for builder elements. Added ability to include additional global forms on the product. Fixed conditional logic on main composite product. Fixed some issues with woothemes WooCommerce Subscriptions. Fixed an issue with the template system. Fixed filter errors on Order page. Fixed an issue with the cart replacement image. Fixed an issue where global forms broke when deleted products where used. Change text domain to woocommerce-tm-extra-product-options for compatibility with plugins like loco translation. Added support for WP Rocket cdn for images used on options. Added setting to disable add to cart button until an option is checked. Added two new char based price types. Added setting to display a reset icon for radio fields. Added prefix and suffix to display discounts on product page for Dynamic Pricing & Discounts. Fixed showing the correct thumbnail on cart when image replacement is used. Fixed Orders display when no fields are being used. Fixed the clear cart feature. Fixed rounding of price options. Fixed Free price replacement on related products. Advanced cart setting doesn’t override email templates any more. Fixed compatibility with Composite Products. Fixed the edit options feature for checkboxes and radio buttons. Fixed a case where options cannot be saved. Added default value setting for range picker. Added setting to show quantity selector only for elements with a value. Added advanced cart display setting. Added ability to edit options after product has been added to cart. Changed the display of options on admin Order view. Fixed an error on add to cart validation. Fixed woothemes Subscriptions to include saved options when changing subscriptions. Fixed a bug on limit box selection. Fixed a bug where the upload field didn’t save the price to the cart. Fixed a bug with the date picker if only Sundays where disabled. Fixed a bug with the date picker showing the calendar at the bottom of the page. Fixed a bug with Currency Converter when using certain price types. Fixed a bug on import/export function with utf-8 headings. Fixed an issue with prices not calculating correctly. Fixed a bug where a required radio button wasn’t working. Fixed some css issues for mobile devices. Added quantity selector for options. Added selected options to floating box. Fixed some variations display issues. Fixed a bug with price per char. Added reset button for variation attributes. Changed the display of inactive variation attributes. Fixed default values on select boxes. Fixed an issue with Ninja forms. Fixed an issue with the price on the cart not showing up. Fixed an issue with the styled radios and checkboxes. Fixed an issue with the Min/Max quantities plugin. Fixed an issue with quick view. Changed some displayed aspects so that they are always responsive. Added the label setting for the variations section. Rename the Clear variation to Reset options and added setting to choose alternative text. Added setting for choosing the selected border type on swatches. Added setting for choosing the display of terms on variations. Fixed an issue with the Clef plugin. Fixed an issue with image variations not being displayed. Fixed an issue with product image not being changed. Fixed an issue where the Free price label was displaying incorrectly. Fixed an issue where quick view was displaying incorrectly. Fixed the custom widths and height on image variations. Restored tooltip on range picker. Fixed an issue with tooltips on swatches. Fixed an issue with WooCommerce Dynamic Pricing & Discounts compatibility. Fixed some css issues on variations. Fixed compatibility with Woothemes Composite Products. Fixed an issue where a product was displaying wrong price on admin products list. Fixed an issue with conditional logic on select boxes. Fixed an issue with WooCommerce Subscriptions. Fixed a bug on the Change Product image feature. Fixed the Hide uploaded file path setting to include emails and customer order history. Fixed double clicking on radio images. Fixed a bug on price type “Percent of the original price + options” when used on radio buttons. Fixed an issue where the text editor wasn’t updating text when switching modes. Fixed an issue for the “Cannot redeclare wc_get_product()” related error on previous WooCommerce versions. Fixed an error where no initial values where entered for the range pickers. Fixed an issue for Composites products where products having css classes applied on them were controlling the appearance of following products. Added customization feature for variations and they can now used for conditional logic. Added support for WooCommerce Dynamic Pricing & Discounts. Added support for Flatsome quick view. Added support for disabled dates and weekdays on date picker. Added tooltip as an option for subtitles. Added setting to not show the totals box if options price is zero. Added filter ‘tm_epo_cart_options_prices’ applied to options before they are added to product price. Added unofficial compatibility with WPML. Added setting to allow changing the product image with a custom image for radios,checkboxes and select boxes. Redesigned the “change product image” feature to allow the change to happen without the need for the field to have image display. 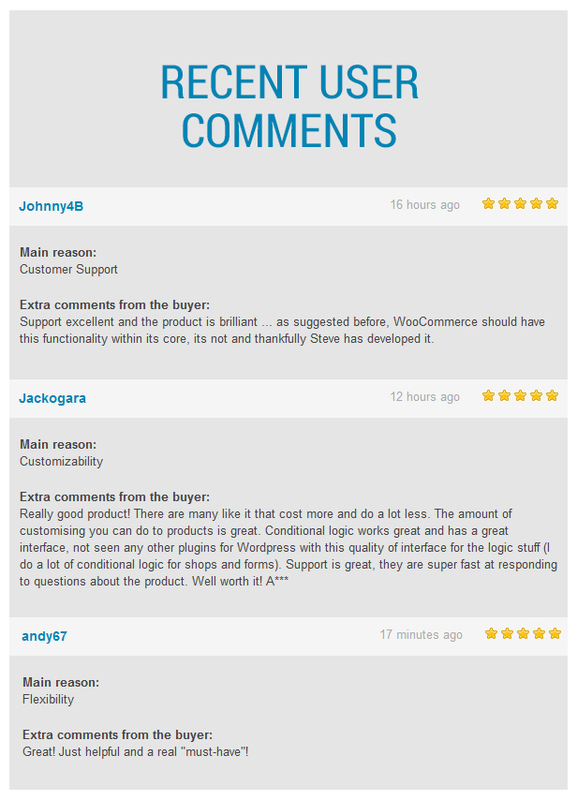 Changed plugin internal name to “WooCommerce TM Extra Product Options”. Restored compatibility with Woothemes Composite Products. Added compatibility with Woothemes Measurement Price Calculator. Added current value price type for text field (donation like). Added setting to enable a floating box of the totals. Fixed an issue with the range picker’s step*price setting. Fixed a bug in shortcodes.. Fixed issue for activation on some server configurations. Added live change on price for textareas and text fields. Added hex color support for replacement images. Added option for checkboxes to allow an exact number checked only. Added support for WooCommerce shortcodes. Added ability to use url parameters to fill field values. Changed the uploaded file path to be a link on cart page. Extended range picker with two more value options. Fixed issue with ninja forms. Fixed an issue with extra slashes. Fixed an issue with the section popup on certain themes. Fixed an issue where styled elements could not be clicked. Fixed an issue were required Fees could not be added to the cart. Added Bundle rate shipping compatibility. Fixed WooCommerce Currency Switcher compatibility. Added default WordPress strings to datapicker. Added setting to always show final total regardless of options. Fix: Fixed fee calculation for WooCommerce 2.2+. Fix: Fixed range picker not displaying when step value was different than 1. Fix: Fixed subscription fee error when the cart was being deleted. Feature: Added two more conditional type calculations. Fix: Fixed URL redirect for image replacements. Fix: Fixed images not showing for radios and checkboxes when lazy load is disabled. Feature: Added Accordion type for sections. Feature: Added range picker field. Feature: Added cart Fee price type. Feature: Added setting to control the placement of the extra options and the totals box. Feature: Added setting to enable the plugin for specific roles. Feature: Added import/export functions to forms. Feature: Lazy load images for radios and checkboxes. Feature: Added setting to change product image for radios and checkboxes. Feature: Added ability to hide options in cart. Feature: Added ability to hide options prices in cart. Feature: Added price per character for textfields and textareas. Feature: Added extra styling for radios and checkboxes. Feature: Added compatibility with WooCommerce Currency Switcher. Feature: Added compatibility with WooCommerce Quick View. Improvement: Added setting for hiding uploaded file path from uses by default. Improvement: Added populate function for select boxes, radios and checkboxes. Fix: Date format now supports the date field as well. Fix: Increased z-index for pop-ups for better display. Fix: Fixed Force Select Options to propertly redirect to product page. Fix: Fixed a bug where products which had exlcluded global options with required fields were still producing validation errors. Improvement: Extended the css class for elements to include the ul and div wrapper. Feature: Added swatch mode for radio button and checkboxes. Fix: Corrected shown value for text fields when product is not added to the cart. Feature: Performance increase for big number of options. Fix: Fixed a bug where required elements did not prevent product from being added to the cart. Feature: Added option for extra css class to element. Feature: Added choice to display a single section as a pop up. Fix: Fixed bug when adding more then 10 sections on builder. Feature: Added extra class names for sections. Feature: Added Display override for totals box. Fix: Fixed display of urlencoded values for labels with non latin characters. Fix: Fixed Add element button on Form Builder. Feature: Added auto update support. Fixed method exists bug for some servers. Added url redirection feature to radio buttons and select boxes. Corrected html display on cart page. Added js trigger tm-epo-after-update after the prices get updated. Corrected php post_limit_vars errors for big forms. Fix: Fixed strip html for order. Fix: Options not displaying on orders when bother label and price are empty. Feature: Added URL redirect setting for radio buttons and select boxes. Fix: Fixed conditional logic to work with required items. Fix: Fixed ut8 support for fields values. 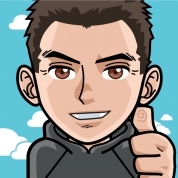 Fix: Extend Strip HTML from emails to include images. Feature: Added Form Builder to Products. Feature: Added notice for successful uploads. Feature: Added FREE label text replacement setting. Fix: Fixed options duplication issue when theme use more than one “woocommerce_before_add_to_cart_button” action hook. Feature: Added ability to include an extra text after the price. Fix: Made the calendar responsive. Feature: Added option to remover FREE label when product has options. Feature: Added option to enable a default value for radios,checkboxes and select boxes. Fix: Updated css to make fields compatible with foundation.css based themes. Feature: Added ability to change Final total and option total strings. Feature: Added setting to strip html from emails. Feature: Added 4 global settings. Feature: Added Conditional logic for fields and sections on the global Form Builder. Feature: Added 1 section style. Feature: Added title and description for sections. Fix: Replaced the woocommerce_tm_custom_price_fields: now accepts the product id directly. Feature: Added compatibility with Composite Products. Feature: Added choice between fixed or percentage price increase. Feature: Added setting to enable the display of fields using action hooks. Feature: Added setting to disable Global Options on per-prodcut basis.